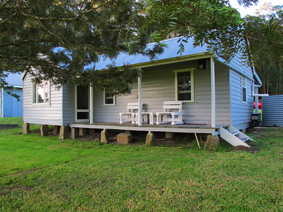 I write this with a deep peaceful sigh from the midst of a three-week writing retreat at Bundanon, the pair of properties given to the people of Australia by the painter Arthur Boyd and his family, on the Shoalhaven River a couple of hours south of Sydney. It’s the second time I’ve had the great fortune to be here. I first came over ten years ago, when I was working on my second novel, The Submerged Cathedral – a book that turned out to be very much about landscape. Then, as now, I found the landscape here creeping not only into my work but my psyche. 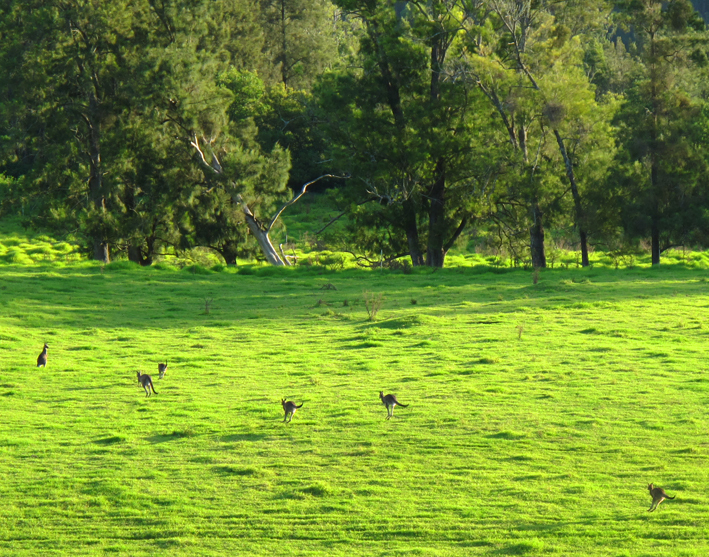 This time the effect is even greater I think, because while last time I worked in a large studio facing a different direction, this time my view, all day every day, is this one: the greenest paddock you have ever seen, often complete with kangaroos and wombats. 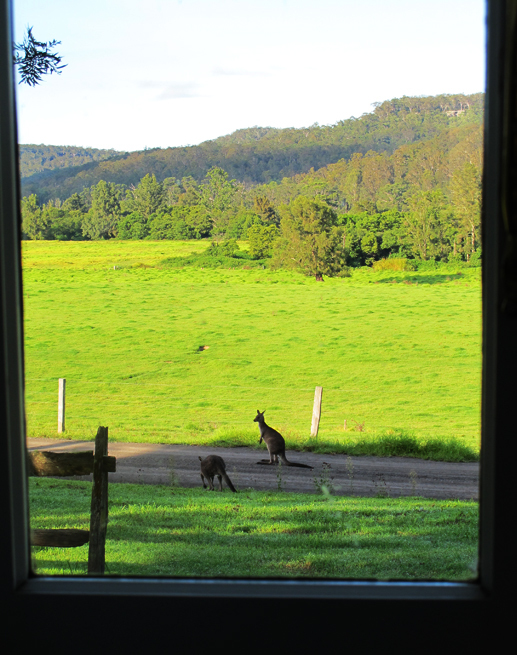 The kangaroos oblige with a morning and evening ballet performance, and the wombats – enormous things – putz around after them. I arrived at Bundanon after a busy month, having travelled from Adelaide Writers’ Week almost straight on to the fabulous Shanghai International Literary Festival and then very quickly to the Snowy Mountains Readers and Writers’ Festival, talking all the way. I am exceptionally lucky to keep being invited to speak at these events, and it’s grand to meet readers of my books. At the same time, there is something that doesn’t really sit right with me when I do a lot of it. For one thing, I grow very quickly tired of the sound of my own voice. Writers are often rather introverted people, and so the performance aspect of speaking in public – as I have been doing for almost 18 months now, having published two books within six months of each other (d’oh!) and spoken at 15 literary festivals as well as assorted libraries and bookshops in that time – can start to erode your sense of who and what you are if you do too much of it. It also means – for me anyway – that the creative well is all but dried up. All that hyper-stimulation and exploration of the outside world means the inside world of my head, where my new novel should be dwelling, has become a rather hollow, empty place. All I have been hearing is my voice banging on and on and on, instead of sitting quietly and listening, which is the only way I can find my way into writing. All of which means that arriving here, to this view, with absolutely no requirement that I use my voice to speak at all, was even more blissful than I would ordinarily have found it. And while I’ve been keeping in touch with home and friends by email (and Twitter, which is where I learned of this lovely surprise last week) at least four days can go by at a time without having to open my mouth to speak. But it’s not only the quiet that is so restorative. I’m absolutely sure the actual view – that wall of green – has as much to do with it (a hunch seemingly validated by this research into “restorative environments”). 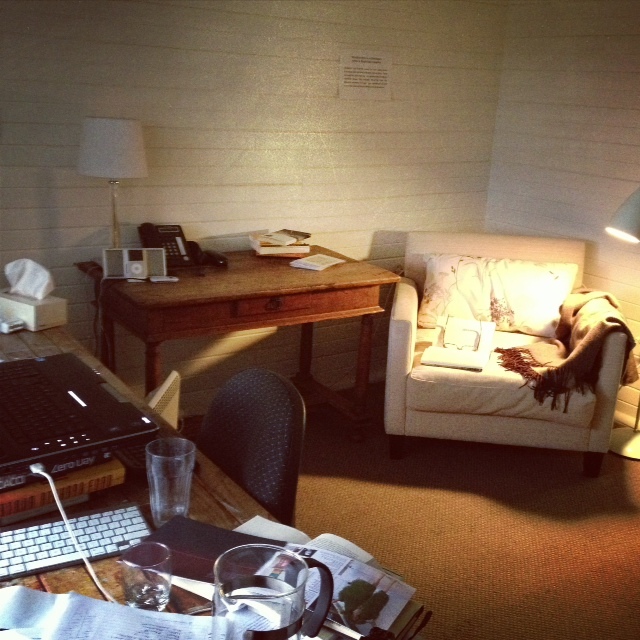 I’m in what’s known as The Writer’s Cottage, just a stone’s throw from the artists’ apartments and studios occupied by other residents – more often visual artists, but this time several other writers, all lovely people. A Musicians’ Cottage is a little further away, set back among the trees. The whole place is such a generous gift – with Arthur Boyd’s studio and the family home a stroll down the hill, and open every Sunday for visitors. It’s a stunning place to visit, so if you’re ever in the Shoalhaven area you really should come to see for yourself. I’m just starting week three, and have been slowly sinking back into my new novel. It’s both a joy and a challenge to be so immersed in it – when you finally get what you want, the result can be confronting. “Oh, if I only had three weeks of pure isolation for work on my novel!” can quickly turn to a terrified “Oh my God, three weeks of isolation to work on my novel?” once you sit down to the blank page and the blinking cursor once again. Then it’s early to bed, and the best sleep I have had in years (interrupted only by the odd bit of thumping and shrieking from a wombat rumpus under the house once or twice, and one night, the sad moans of some yarded cattle down the way), then up early to start again, sitting down with the quiet mind, the blank page, my imagined world and that view. This evening’s dinner is a new soup I’ve made up this afternoon, inspired partly by a mention my husband made of a sweet potato soup he made at home last week, and partly by the happenstance combination of veg in my fridge, and partly by the welcome return of some cool damp weather. 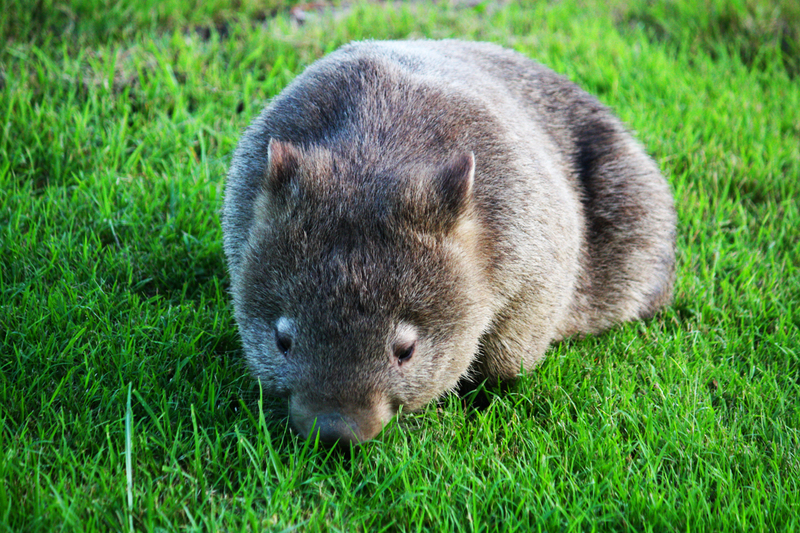 I feel like one of these wombats, shouldering my way back into the long-missed burrow of my writing life. And, even though it’s kind of dark in here, I like it. 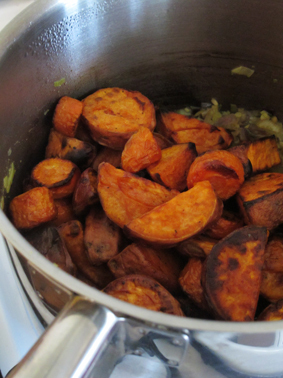 First, I tossed the carrots and sweet potato in olive oil and roasted them till richly browned and caramelised, because – well, because generally I need a good reason not to roast things and couldn’t see one here. While they’re roasting, sauté the onion, leek, ginger, garlic, spices, chilli and finely chopped parsley stalks in more olive oil along with the spices till the veg are soft and the spices fragrant. Add the roasted veg and the chicken stock and simmer over a low heat until the carrots & sweet potato have fallen apart. I don’t peel mine, but you can if you wish. If you don’t have stick blender, the sweet potato skins might be too chunky for some, but I like a bit of rustic roughage! When you’re about ready to eat, add the chopped parsley leaves and mint, season well with salt and pepper, a good squeeze of lemon juice and a little zest, and turn off the heat. Pour the second glass of wine, spoon the soup into a deep bowl, add a dollop of yoghurt and another mint leaf or two, take up your Alice Munro (or Hilary Mantel or Elizabeth Strout or James Salter, all of which I’ve been riveted by here – except maybe the Salter which although brilliantly written is giving me the 70s Love God Great Man Writer heebiegeebies a bit), settle into your comfy chair and enjoy your evening. 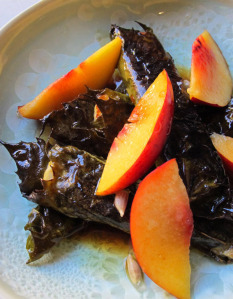 Have you noticed how certain dishes can end up defining a time or a season in your memory? In our house this seems especially true of salads, and of summer. In the past we’ve had the Summer of Quinoa, and the Summer of Citrus Couscous (the latter remaining the strongest food memory of a road trip we took with dear friends to Perth and back over a decade ago, camping and couscous-ing all the way). Well this summer of 2012-13 will most definitely be remembered as The Summer of the Cypriot Salad. Or maybe the Jewellery Box Salad, as I’ve come to think of it. It’s so beautifully colourful and baubly to look at, I find myself gazing adoringly at it almost for longer than I spend eating it each time. 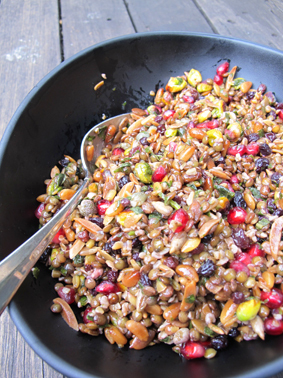 It’s also become fondly known as the Freaky Salad because it uses freekeh (the nutty and chewy green cracked wheat which can be found in some health food stores, but can be quite difficult to get hold of ). In my last post I think I mentioned how much we loved Hellenic Republic’s “Kipriaki salata dimitriakon – Cypriot salad of grains, pulses, nuts, yoghurt” that we ate during a visit to Melbourne in December. I couldn’t stop thinking about it even days after we got home; the sign of a great dish, don’t you think? A hunt around the internet yielded this recipe. However, the ratio of lentils to freekeh here didn’t really match my memory (or preference) so I tweaked it a bit to come up with an ever-changing version that we’ve made over and over. The restaurant version included a dollop of yoghurt and, I think, some cumin, both of which are delicious additions although I have tended not to bother with either over time. It’s the kind of dish where quantities hardly matter, to be honest, so you will find your own way with whatever you have to hand. The only non-negotiable essential is the puy lentils, I think – and although I have made it without the pomegranate seeds, it is so very much better with them that I’m not sure I’d bother going without. 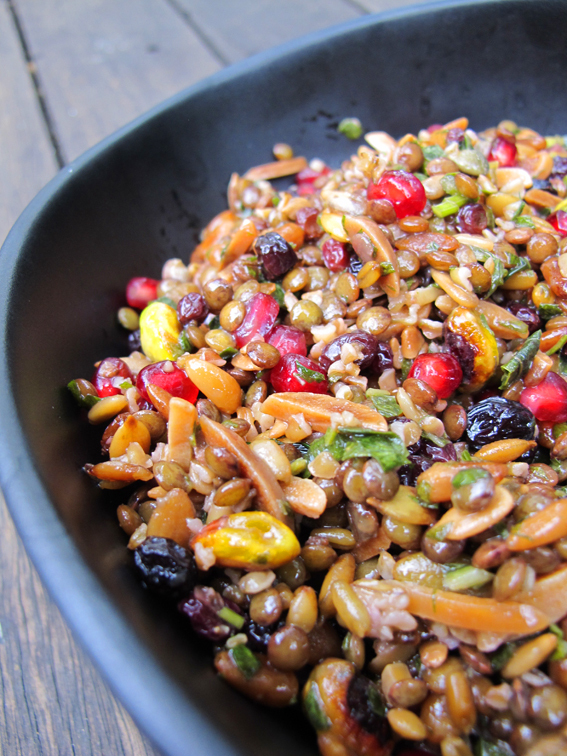 The pumpkin and sunflower seeds are also quite necessary for the salad’s lovely surprising crunch. This dish has two huge advantages apart from being swooningly good to eat. First, it keeps in the fridge for days and days and days without any noticeable fade in quality, and it is incredibly filling. I discovered just how seriously so for both factors when we made a huge amount for a lunch party and then spent the entire rest of the week eating the leftovers for lunch and dinner. Soak the dried fruit and capers in the orange juice while you prepare the rest of the dish. Cook the lentils and freekeh or wild rice separately in boiling water until just tender – I cook the lentils for about 15 or 20 minutes and the freekeh or rice for longer; you want them to retain a tiny bit of bite while still being properly cooked. When lentils are cooked, drain and then immediately sloosh with some olive oil and salt to give a nice glossy coating and stop them sticking. Add the grain or rice when drained and stir well. While that’s happening, toast the seeds and nuts in the oven or on the stove top – the usual advice about not looking away applies! If any of them really burn, throw them out and learn your lesson – the bitterness of burnt nuts will taint the whole dish. Remove the seeds from the pomegranate making sure to avoid the pith – the easiest method is the satisfyingly violent one detailed here. When the nuts are coolish, chuck all ingredients into a bowl and mix gently but thoroughly. 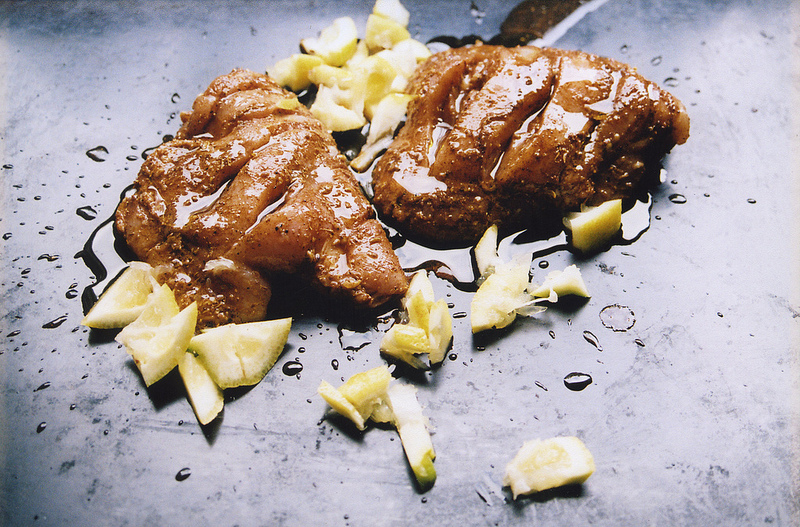 Add more lemon juice or olive oil to taste, season well and present with a flourish. Now your turn – what’s been the defining dish of your summer so far? Any favourites to share? I love how the best meals so often come about through serendipity. Last night’s was like that for us, prompted by a gift from my friend Tigs last week (delivered along with a fresh batch of Alice Thomas Ellis books, woohoo!) – a little bag of these rather beautiful hazelnuts from the Blue Mountains. My first thought was to serve the chopped hazelnuts with green beans, but then I decided to try something new, so turned to my trusty Eat Your Books account to search further afield. I can’t recall if I’ve raved here before about EYB, though I certainly have elsewhere. In fact, here’s what I wrote about them for Good Weekend magazine earlier this year. Have too many cookbooks, yet still find you’re always Googling recipes? Eatyourbooks.com is a search engine for the cookbooks you already own. Register, then simply type in the book titles to create your database. Then enter ‘cherries’, for example, and up pops an index of every recipe using cherries in your collection. Choose one, pull the book from your shelf and cook yourself happy. The site’s index is often far superior to those in your books, and provides a shopping list with each summary. It’s a global site with an impressively vast and growing Australian book list, and even includes options for indexing blogs, obscure books and your own ragged clippings. $25 per year. I have no affiliation with EYB apart from being a huge fan of this idea and of the very cool women who run it. It was started by sisters Jane Kelly & Fiona Nugent, but has grown heaps. Their customer service, from what I’ve seen, is brilliant and the site is so well designed and constructed I use it all the time. It also now has a mobile version so you can look up stuff from your smartphone while you’re shopping, and it will provide you with a shopping list of ingredients you need for each recipe – ingenious! One of the best things about it is the quality of the indexing, which means you can often find things here that won’t appear where you expect, if at all, in your cookbooks’ own indexes which are often pretty basic. Yesterday was a case in point. My search for ‘hazelnuts’ brought up a zippy-sounding dish from the first (much loved in our house) Ottolenghi book – a red pepper & hazelnut salsa. But when I searched in the book’s index I couldn’t find it, until I looked up the full recipe title handily provided by EYB – ‘Salmon with red pepper & hazelnut salsa’. And then off I went – but without Eat Your Books I doubt I would have come across it at all. And it was good. We planned to have it with some panfried snapper fillets, and I was toying with another couple of side dish ideas – but then I spied that the opposite page to the salsa recipe held another great Ottolenghi combo: sweet potato with a lime, chilli and coriander dressing. More serendipity, and more divine dinner for us. Anyway – back to the nuts! First step was to crack those babies – our bowl of nuts yielded about 50g of hazelnuts. I think I used about 30g in the dish and saved the rest – shelling nuts always makes me appreciate how relatively cheap it is to buy shelled nuts, because with hard nuts like these it’s a bit of a palaver. Once I got into the rhythm of it with our nutcracker – also known as The Big Red Pliers – however, it only took about five minutes. Collecting all the sharp little bits of shell out of the stove fittings, off the floor, the kitchen shelves and so on took a little longer. They were very nice raw, even with the slightly bitter skins on, but toasted in the oven for ten minutes and with most of the skins rubbed away they were really good – crunchier, and with the unique, slightly sweet flavour that hazels have. Next step was to roast two red capsicums until the skin blackened enough for peeling, and then I cut it into thin strips rather than finely chopped as the recipe says. A dressing of chives, lemon juice, a single finely chopped garlic clove, olive oil and the surprise star ingredient of apple cider vinegar made this a really delicious side dish. We’re trying to eat more veg so along with the sweet potato we had some blanched green beans and gorgeous balsamic roasted beetroot. I used to always roast the beetroot whole and then remove the skin – but now I just quarter it and roast in pieces, keeping the skin on (hooray, yet another way to avoid boring & annoying peeling!) and then tossing the caramelly chunks in a spoonful of Balsamic vinegar just near the end of cooking. I have to say, this was one of the best dinners we’ve eaten at home for ages – and all resulting from a friend’s generosity, a couple of gals with a smart idea and a computer – and serendipity. What about you – made anything good by happy chance lately? Regular visitors to this blog might recall that I am an avid fan of the aubergine. I’m also a fervent admirer of Mr Nigel Slater, whose recipes and writing in the Guardian I have always loved for their elegance and flair. I have his wonderful veg book Tender, and I shortly hope to deepen my acquaintance with hm via the TV series showing on the ABC – haven’t seen the show yet but look forward to it, to see if he can replace Mr Fearnley Whosywhat in my affections. I do feel I know him quite personally now, as recently my nieces Anna and Rosie, both budding fine cooks (cue gratuitous photo opportunity – there they are below, after teaching me how to make pasta), sat me down at their house to watch the rather wrenching film version of Nige’s autobiography Toast (they had seen it twice – their other fave watch-over-and-over again movie is Julie & Julia. You can see why we get along). Anyway – this week my warm feelings for Nigel, the oven and aubergine converged in perfect harmony when I came across Mr Slater’s wondrous Baked Aubergines with Thyme and Cream in Tender, also handily online here at The Guardian. This rich, rib-sticking winter food is something the English do particularly well, I think, do you? I have now made this twice – once as per his recipe, and once with a couple of very minor variations. Nigel salts his eggplant slices and then fries them in oil before layering with the onion and thyme and garlic, but given that one then swamps the whole thing with cream (oh yes) and also that I am lazy, the second time I just sliced the eggplant and grilled on the barbecue before layering. Or you could dry-fry them or brown in the oven with the same result, I think. I also added some chopped tomato to the onion & garlic, taking a little passegiata down the parmigiana route. The second time I made this I served a big dish of it with some slow cooked lamb and lentils to a table of eight, and everyone loved it. Saute the onion slices gently in some olive oil till soft, then add garlic and fry a few more minutes. Add tomato, cook till soft and combined. Lay half the eggplant slices in the base of an oiled baking tray, then spread most of the tomato-onion-garlic mixture over the top. Scatter the thyme over and season this layer. Layer the remaining eggplant over the mix and then the last of the tomato mixture (I didn’t do this the second time but it looks nicer and more golden if you leave some onion on the top so I will from now on). Pour the cream over the whole dish, making sure to go to the edges. 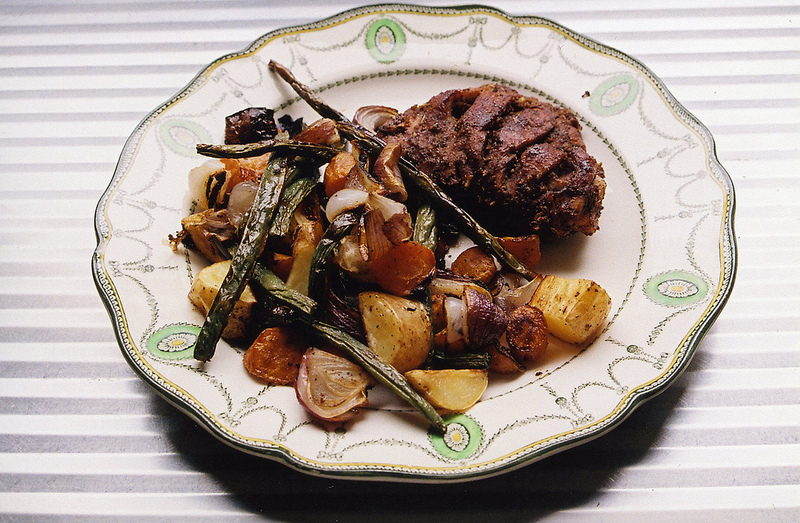 Season, sprinkle with the Parmesan and bake in a moderate oven for around 30 to 40 minutes or until golden and bubbly. Remove from oven and allow to rest for a few minutes before serving. Yoghurt, my new hobby as you know. The slow-roasted lamb served with this aubergine was very similar to this one, though with less liquid and just loads of garlic instead of the other vegies, and as the lamb was only a bt over 2kg I cooked it at 150 degrees for only about four hours – was perfectly falling-off-the-bone and delicious though. Chicken stock (if I don’t have chook stock in the freezer these days I get a bit edgy – but the other day I didn’t think of it till mid-evening, so just chucked everything in the slow cooker till morning – it was fab, and addressed recommendations I’ve recently been given by more than one good cook to barely simmer the stock and cook it much longer). Our old standby fish curry with salmon instead of prawns & fish – love it – and this time I also made a very basic Charmaine Solomon mattar paneer (peas & paneer cheese) to go with it (leaving the peas out of the fish one) and the always-fabulous CS leeks mirisata as an accompaniment. Senor made two of Karen Martini’s amazing seafood pies and a huge batch of spag bol for some family friends who are having a rough few weeks. The rough puff pastry for the pies was mine, happily leftover and waiting in the freezer after my beef pies (see below). The seafood pies include Israelis couscous and lots of leek and tasted divine. Another weeknight standby – pasta with cauliflower, chilli, anchovy & pine nuts – ours is adapted from a Neil Perry book but is a standard classic and very similar to this one. What about you all – any weeknight faves you wanna share? Or random triumphs that need boasting about? Eggplant issues? Love to hear your thoughts. You are currently browsing the archives for the vegetable category.